All exhibitions at Museum of Glass (MOG) are supported by the curatorial team. It is our job to make sure the galleries look spectacular for our visitors to enjoy. Museum of Glass crew off-loading crates for an exhibition. Museum of Glass curatorial team after completing installation of the “Fax Room” for Chihuly Drawings, March 2015. In addition to keeping our objects looking beautiful, it is also our job to keep them safe. And as a museum, we are challenged to keep them safe “in perpetuity” (which means forever)! How do we do that, you ask? Fortunately, we have colleagues throughout the world who study the effects of the environment on a variety of historic and art objects and set out guidelines for their care. We use a system of policies and procedures (called “Preventative Conservation”) to combat the effects of all “agents of deterioration”. Defined by the Canadian Conservation Institute, “The agents of deterioration identify ten primary threats specific to heritage environments and encourage their prevention at the collections level.” The ten agents are: Direct Physical Forces, Thieves and Vandals, Fire, Water, Pests, Pollutants, Light, Incorrect Temperature, Incorrect Relative Humidity, and Dissociation. So, how do we at MOG go about combating these agents, and how does what we do apply to your own collections at home? In a series of blog posts, we will share how MOG implements the preventative measures for every one of the agents. This post is dedicated to “Direct Physical Forces” which includes things like: shock, vibration, abrasion, and gravity. This is a big one for glass! Since the Museum is seated in the Ring of Fire, our staff is always thinking about how to protect our fragile artifacts from the vibrations potentially caused by earthquakes. At the same time, we are taking precautions against the rumbling trains rumbling past our building and the possible accidents that might result from a potentially clumsy visitor or while setting up an exhibition. Visitors to Museum of Glass enjoying Irish Cylinders by Dale Chihuly and Seaver Leslie with Drawings by Flora C. Mace, 2013-14. Objects are at risk from damage every time you handle them. We use several methods to secure objects to the platforms they are displayed on. 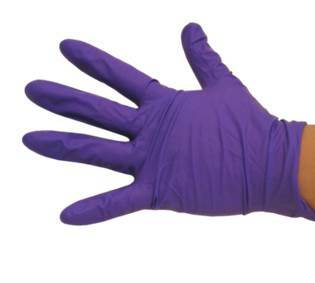 One of our favorite materials is a sticky substance called Rhoplex N580™ that aids our team in securing objects of many sizes. Rhoplex is placed on the bottom of artwork. These sticky dots keep objects from sliding around or falling over. For larger objects, or ones that are more at risk of toppling over, we use a latex water based adhesive (it’s a lot like silicone). Once it dries, the adhesive “glues” the artifact down. 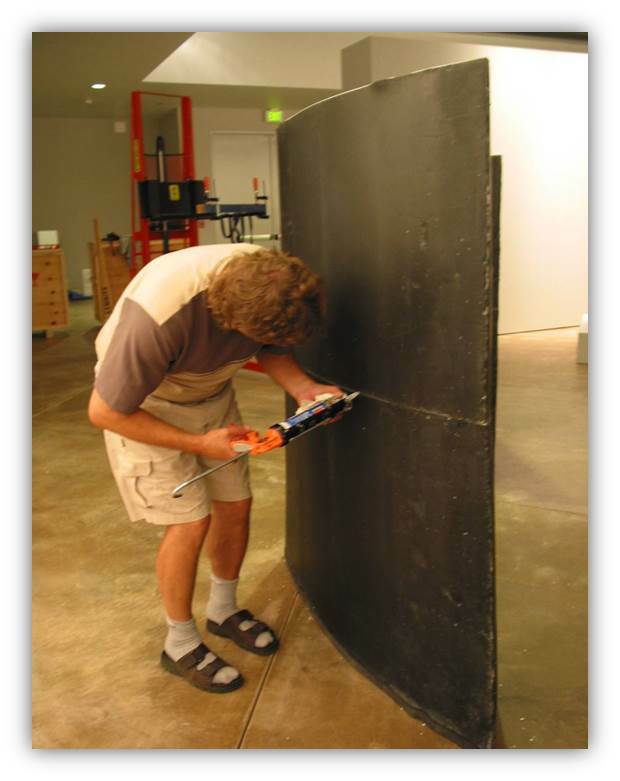 Museum of Glass crew member securing segments of work by Stanislav Libenský and Jaroslava Brychtová, 2002. For objects that don’t sit flat on the top of the display case, or need a little more security, we call a “mount maker,” a specially trained technician who builds a customized support—usually out of metal—that locks onto the object and generally gets screwed to the display furniture. For really large artifacts, we consult with structural engineers who make sure that we have designed our mounts according to the proper building codes. 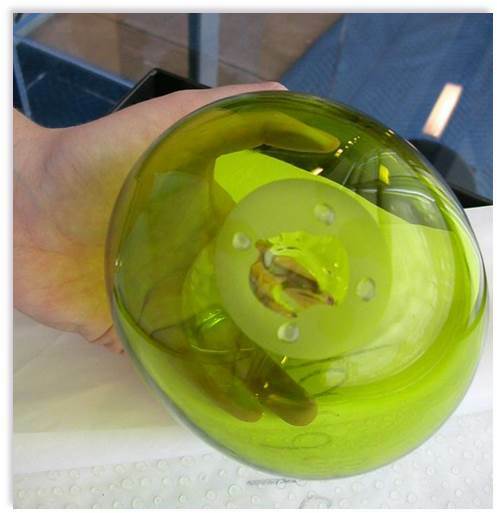 Museum of Glass’ mount maker created this special support for Sewage Combo, 2010. Designed by Alex Baldinelli. Collection of Museum of Glass. Museum of Glass crew installing Preston Singletary’s Clan House, 2008, onto a specially engineered Plexiglas™ support. Collection of Museum of Glass. When you visit our Museum, or any other, there are always many more objects stored behind-the-scenes that will be used in future exhibitions, or by researchers. We want to keep those objects safe, too. Our storage shelves are very carefully designed to prevent the glass from sliding off the edge as well. 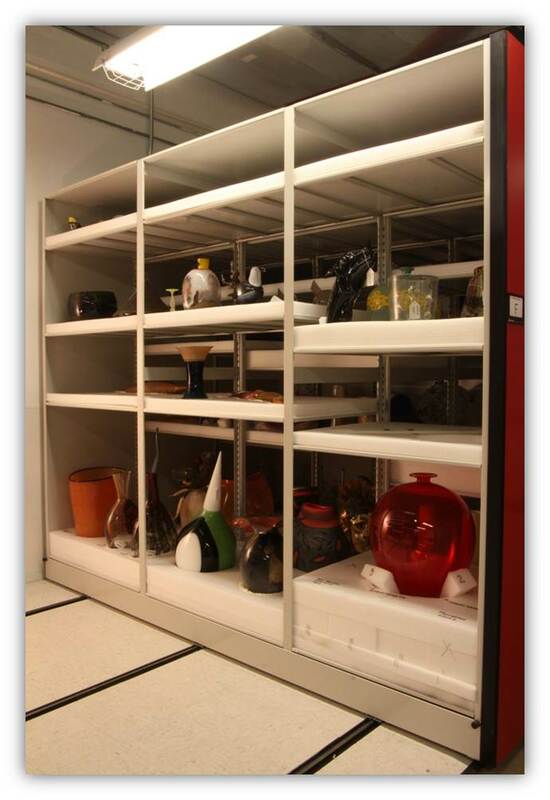 Museum of Glass’ Permanent Collection is safely stored—each with a customized nest in the compact foam-lined shelves. Handling artwork is where most accidents can happen. 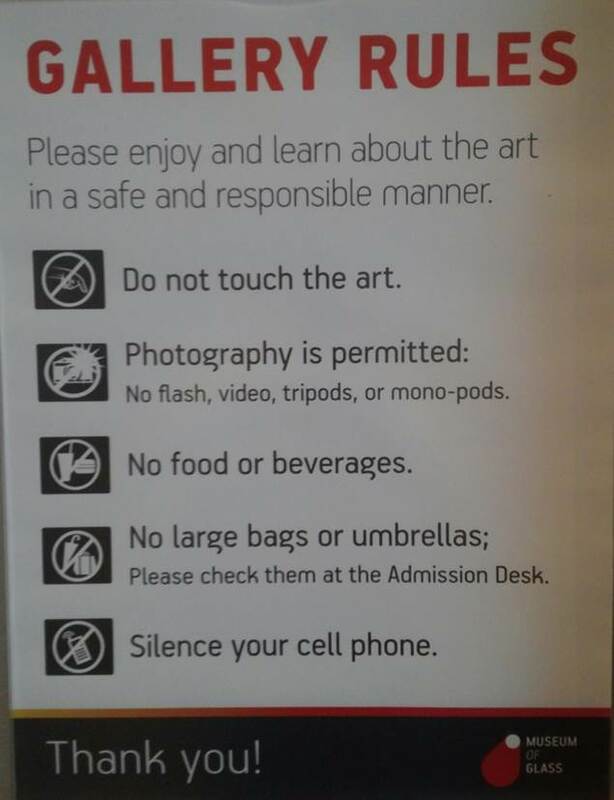 So, at MOG, we are all carefully trained on how to follow a specific set of rules to protect our collections. We use a lot of specially designed equipment as well as some things you might see in your own home. Transportation to and from the Museum is something we plan very carefully. There are even commercial transportation companies that work exclusively with (or have a special fleet assigned to) fine arts. We also build crates designed to minimize shock and vibration during the journey, which might be as far away as Australia! Look for our next post about dealing with protection from thieves and vandals! Rebecca Engelhardt is the Registrar/Collections Manager at Museum of Glass. Her background includes ten years at MOG, plus time at major museums such as Smithsonian Institution and The John and Mable Ringling Museum of Art. This entry was posted in Art, Care of Glass, Curatorial, Exhibitions, Glass, Installations, Museums and tagged Agents of Deterioration, Curatorial, Direct Physical Forces, glass, Museum of Glass, Museums, Preservative Conservation, Rhoplex N580, Ring of Fire on October 20, 2015 by Museum of Glass. In celebration of Kids Design Glass Too (open at Museum of Glass through July 12, 2015), we partnered with five local high schools to continue the original spirit of the Kids Design Glass program – celebrating the creativity and artistic abilities of young artists. We received 28 project proposals from students at Federal Way High School, Lincoln High School, Tacoma School of the Arts, Thomas Jefferson High School and Wilson High School. Five of these proposals were selected by MOG curatorial staff to be made into full-scale dioramas for the exhibition. This diorama is set in the town of Greasy Gulch, where Hamburger Cowboy and his sheriff Frank Furt defend the saloon from some seriously evil extraterrestrial veggies. A close-up of one of the aliens threatening the peace of Greasy Gulch. 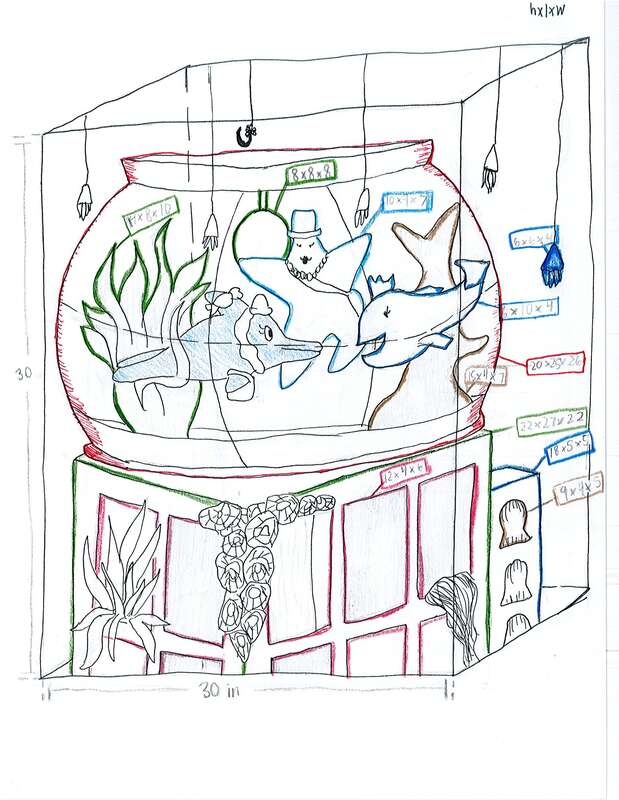 The diorama (represented here by a scale drawing) will feature the “scene of the crime” from Blinky the Crab’s original artist statement – the fridge where Blinky consumes the radioactive donut. 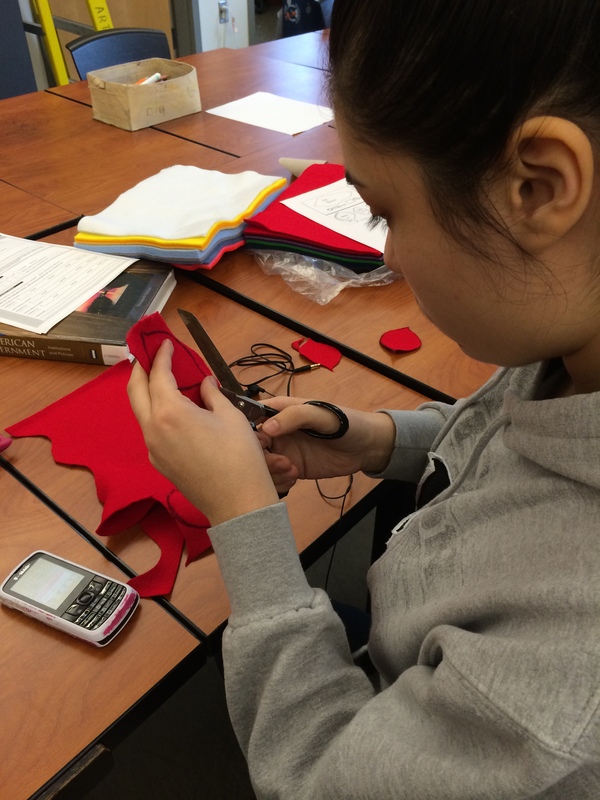 Students Belen Contreras, Angel Zuniga and Jorge Zuniga from Lincoln High School are developing new skills in sewing and textiles to make parts of their diorama. Diorama Title: Girls Night!!! This dolphin is ready for a girls night out! 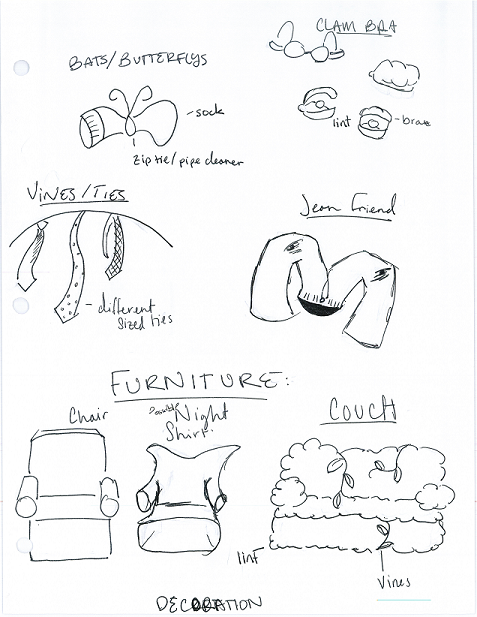 Student Emma Jury is designing an underwater city, including the Dancing Bowl, where renowned underwater fashion designer Penelope the dolphin spends many evenings out dancing with the girls. 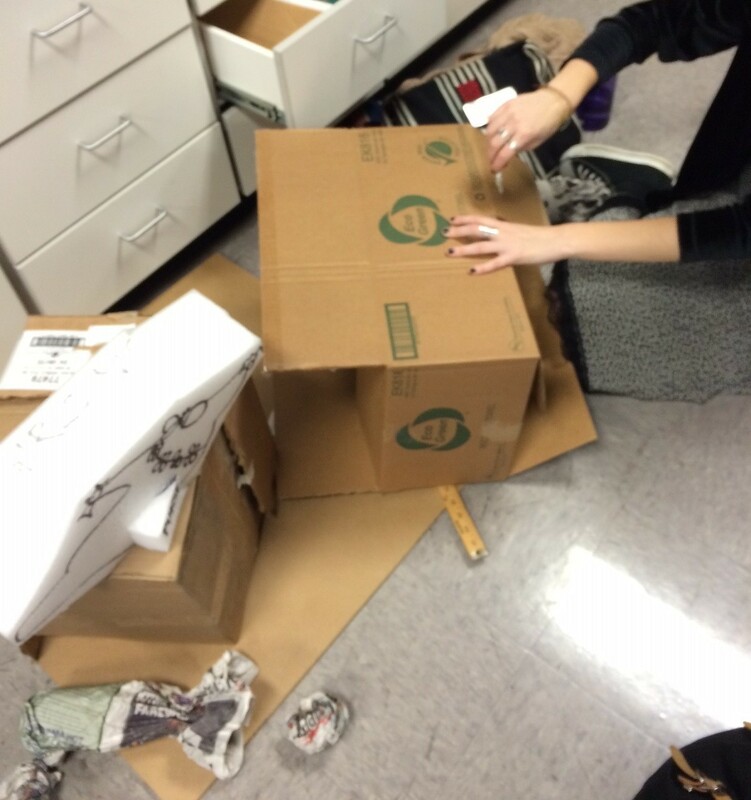 SOTA students work on constructing buildings for their diorama. 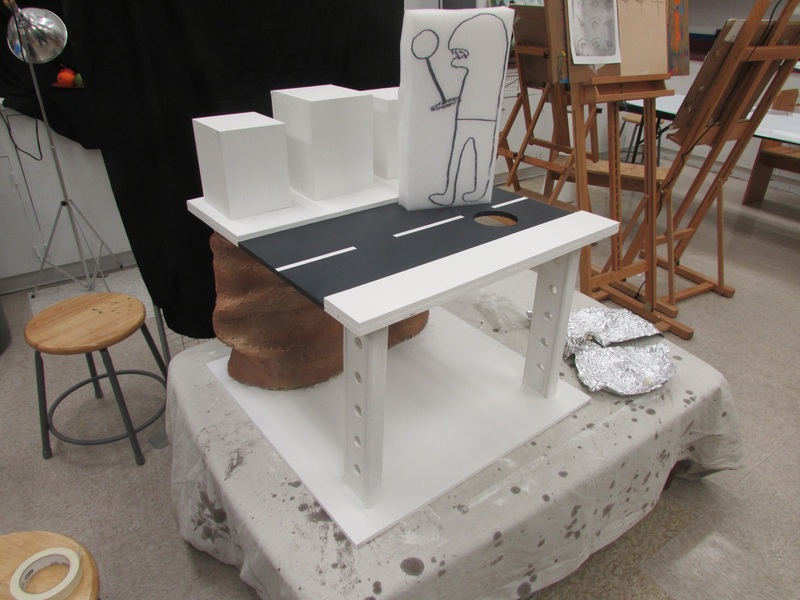 A mockup of the diorama from Thomas Jefferson High School. It features Dino Guy as the Phantom, a character who lives underground in the sewer system and comes up at night to raid the candy store. 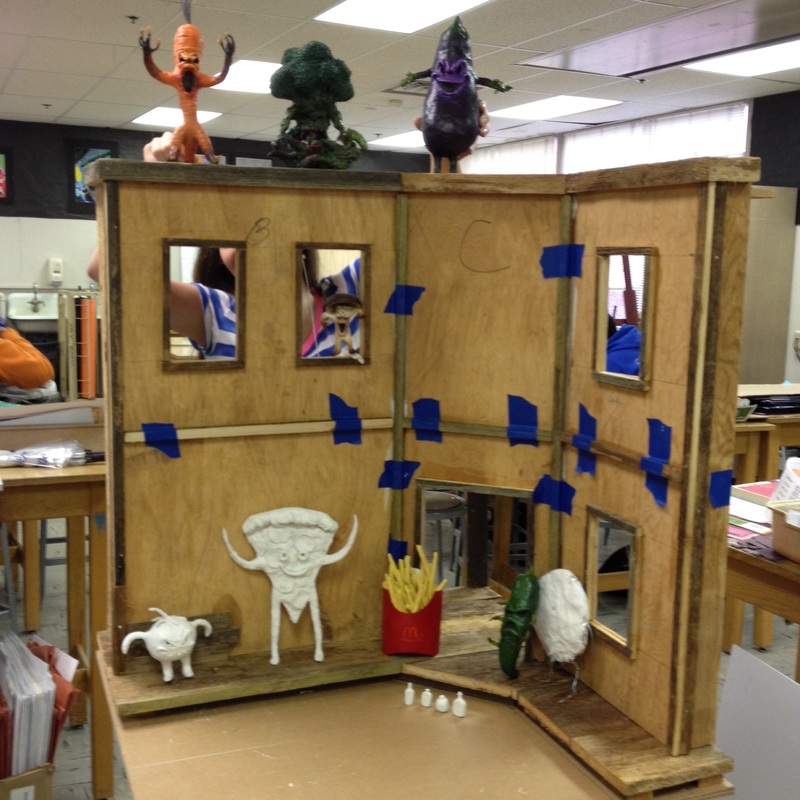 Students at Thomas Jefferson High School have successfully finished building the wood frame for their diorama. They are using a foam replica of Dino Guy to make sure they are building everything to scale. Diorama title: Welcome to my Crib! 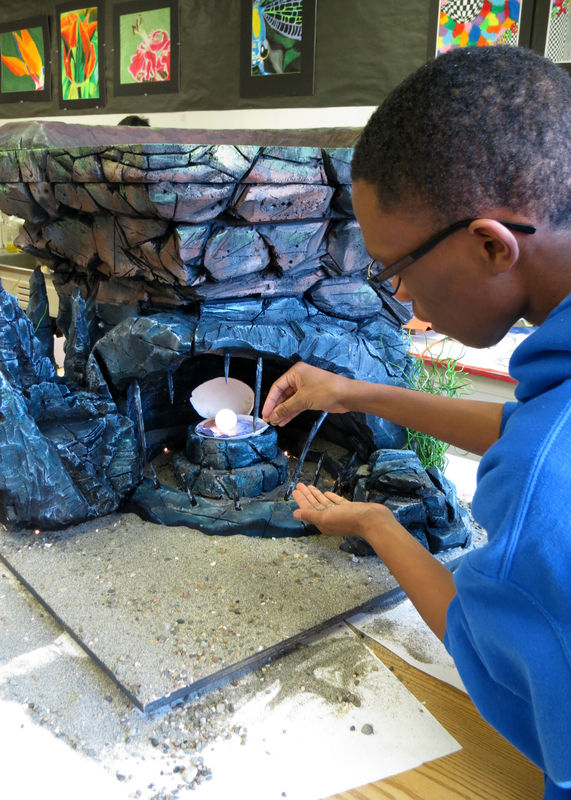 Since Wilson High School has a Hot Shop, their team is working on hot-sculpting several elements for their diorama. 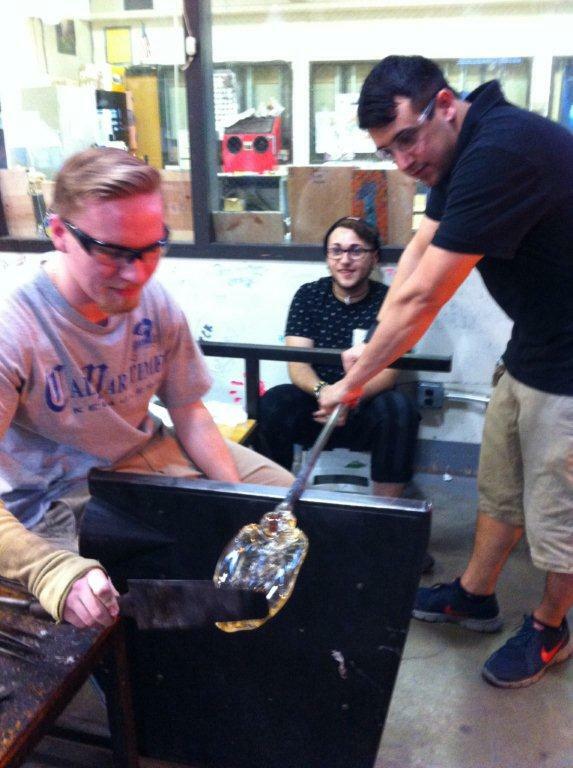 Students Jonah Ellestad, Cordell Corbin and instructor Tony Sorgenfrei are seen here working on a hot-sculpted couch. 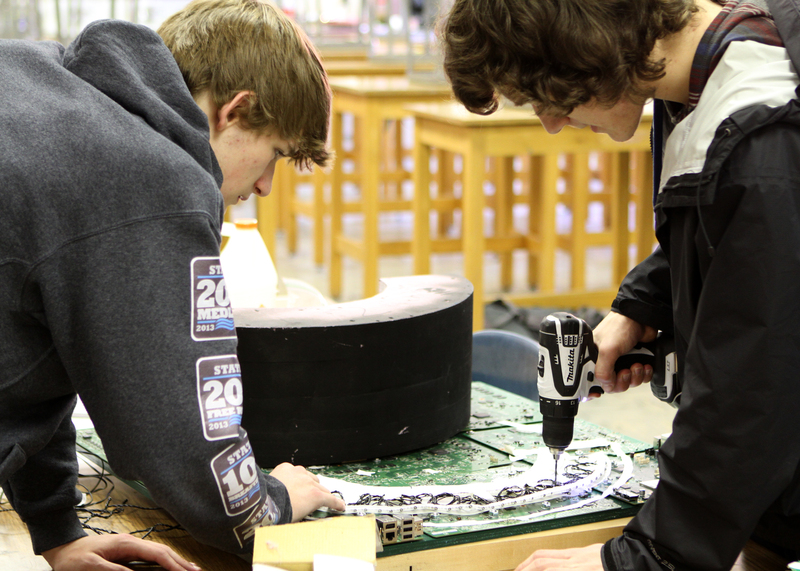 Students from Tacoma’s Wilson High School are recreating the washing machine home of the Sockness Monster, partly inspired by the swampy home of Scotland’s infamous Lochness Monster. This sketch details some of the components of the diorama. 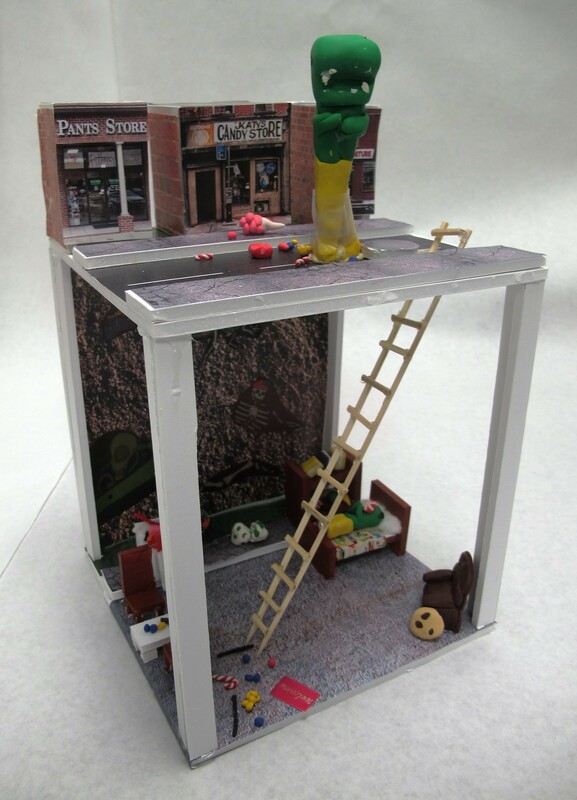 These dioramas will be installed and on view at Museum of Glass April 22, 2015. Come check them out! This entry was posted in Art, Diorama, Exhibitions, Glass, Installations and tagged Artist, Diorama, Exhibit, KDG Too, Museum of Glass, Students on March 18, 2015 by Museum of Glass. 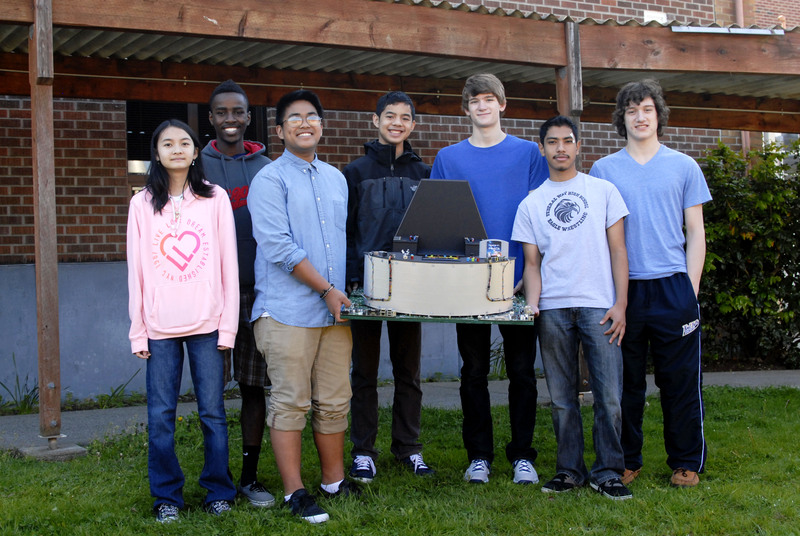 Last week I caught up with one of our teams from Federal Way High School, who designed a diorama for the Kids Design Glass piece Tis Ausome Landshark Ausomeness. This week, I chatted with Tran Chau, Edward Garcia, Peter Gitau, Paolo Honrade, Robert Hughes, Aaron Mathews and Jeremiah Mored who created a futuristic spaceship for I Come in Peace. Tran Chau, Edward Garcia, Peter Gitau, Paolo Honrade, Robert Hughes, Aaron Mathews and Jeremiah Mored pose with their diorama. Describe the materials used to make your diorama. We used pink insulation foam to sculpt the chair and the front console of the diorama. The floor was constructed out of XBox motherboards, and we used the pieces – USB ports, power cells, and so forth – to decorate the console. We stripped old wires to place on the outside of the front console. Silver corrugated cardboard was used to layer the outside of the console. Finally, we used a black foam core to cover most of the insulation foam. 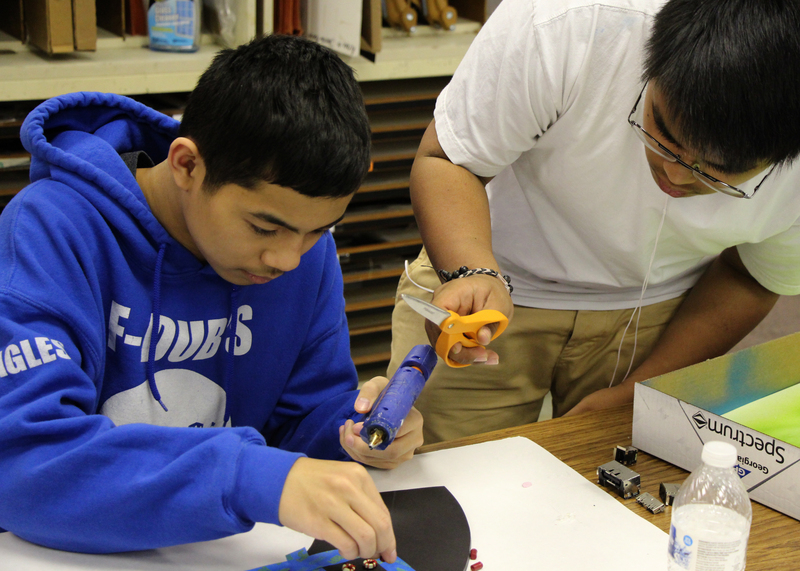 Paolo and Jerry take hot gluing to a new level – they carefully trimmed off all of the strings so that the glue wouldn’t be visible on the control panel. What was the most challenging part of making your diorama? Shaping the console and chair took most of our time. We had to make sure the foam was secured and sculpted correctly. Our group had to be certain that everything would fit and look neat together. Every component was covered with a coating of spray paint and foam core, which needed to be kept clean. Where do you think the alien is traveling in his spaceship? When we first saw the glass piece, our group imagined that the alien would be in his spaceship, flying around to different planets and meeting its inhabitants. The name I Come in Peace made us believe that the alien was talking to people and trying to make friends. Which part of the diorama are you most proud of? We are most proud of the lights on the diorama. It took a lot of work to position them correctly and place the wiring so it is unobtrusive to the rest of the diorama. The electrical wiring for the lights is carefully concealed underneath the console. Who worked on the diorama? Which parts were they responsible for? Aaron and Robert drilled down the console, platform and the chair. They also ripped apart the motherboards, and several people had to use band aids due to many injuries. 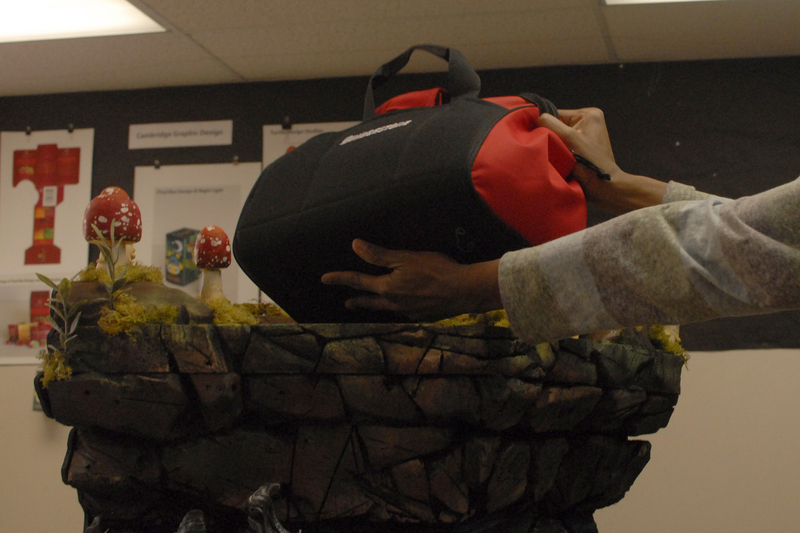 Edward created the artwork on the N64 game, and created the design for the diorama using a 3D program (Sketch-Up), which worked out all the dimensions. Tran worked on spray painting the foam, diorama floor, and console buttons. Paolo and Jerry worked on gluing down and securing most of the decorations on the console and chair. This entry was posted in Art, Exhibitions, Glass, Installations and tagged Ausome, Ausomeness, Diorama, Glass-o-rama, I Come in Peace, Kids Design Glass, Landshark, MoG, Museum of Glass on May 15, 2014 by Museum of Glass. In our new display, Glass-o-rama: Habitats for Kids Design Glass, we challenged local high school art students to design a diorama inspired by one of our Kids Design Glass pieces. The three selected dioramas are currently on display in the Grand Hall through September 7, 2014. I interviewed Kenai Brazier, Courtney Cox , and Justin Kon, from Federal Way High School to find out more about the diorama they created for Tis Ausome Landshark Ausomeness. 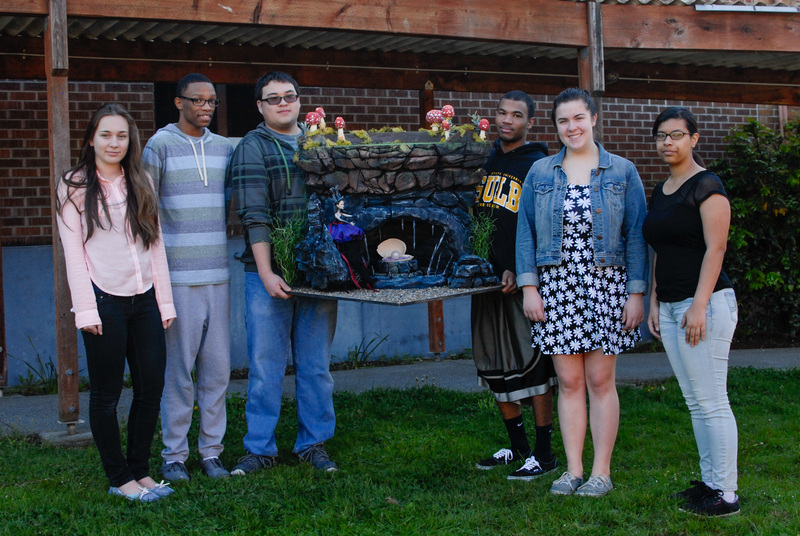 Kenai Brazier, Courtney Cox, Kara Hatcher, Justin Kon, Jalal Lawrence, Elizabeth Abramchuk pose with their diorama. How did you make the Sea Cave featured in your diorama? It looks so realistic! KB: For the bulk of the diorama we used pink insulation foam that was nailed together, and then sawed into the shapes we wanted it to be. After that we hand-carved into the foam with a heat knife, and sanded it with sandpaper. We dry-brushed the cliffs with a wide assortment of acrylic paint. Glitter Glue was then added to parts I knew I wanted the light to hit to create an underwater feel so that way it would separate it from the half with the Landshark on it. Planks of foam were sculpted and then glued together to make the Sea Cave. What other materials did you use to create a realistic environment for your diorama? JK: We used air dried clay to sculpt the mushrooms and the clam. We used a ping pong ball for the pearl. We used actual sand and pebbles for the sea floor; we also used a real clam shell. For our sea queen we used a Barbie. Sand is carefully applied to make the sea floor. JK: It’s hard to choose just one when everything turned out so “ausome”, I am especially proud of how the cliff turned out since it was such a large task. CC: The most challenging part of making the diorama was making sure everybody agreed on things like the structure. KB: The Sea Queen….definitely the Sea Queen. Originally she was going to be cut out of the diorama because she would be a distraction from the Landshark. However, I fought for her to stay in the diorama because I thought that it was critical for our diorama to tell a story. In a story you need a plot, a conflict, and a meaningful ending. The Sea Queen ended up playing an important role in our diorama because of her critical role in our story. 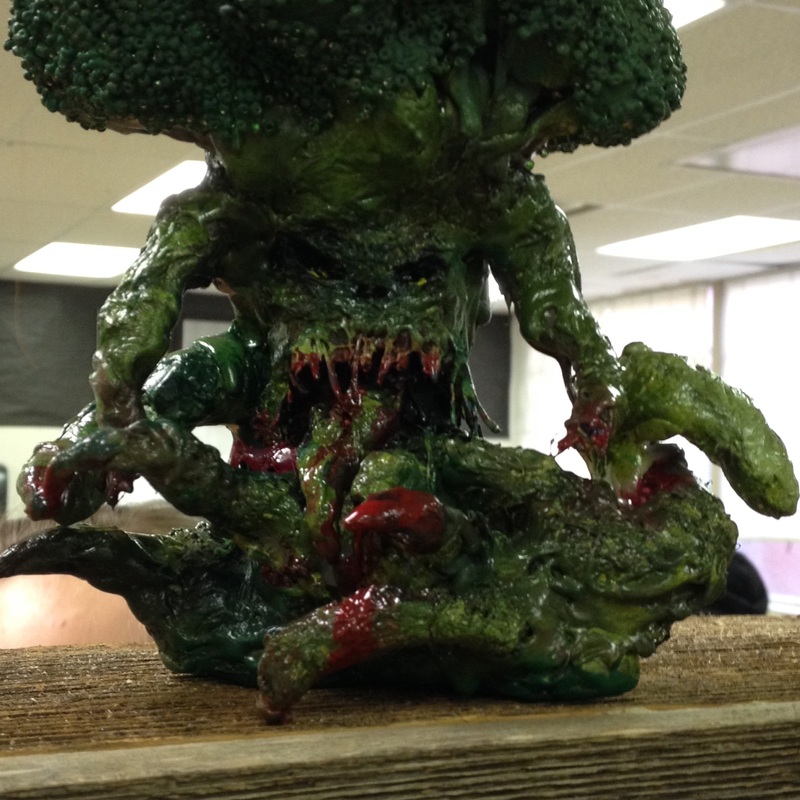 And, all of the hard work Kara put into making her is what I believe put our diorama idea above the rest. A 25lb weight was place on top of the diorama to make sure that the Sea Cave was strong enough to support the glass artwork. CC: There were a total of six people in our team, Kenai Brazier, Courtney Cox, Kara Hatcher, Justin Kon, Jalal Lawrence, and Elizabeth Abramchuk. Everybody pitched in to create the diorama and offered up ideas and solutions. Kenai did most of the designing. Kara did most of the work on the Sea Queen. Elizabeth did a lot of the painting; she helped paint the rocks, the cave, the throne and the mushrooms. Jalal helped with sanding and carving the foam. Justin helped a lot with the carving. He also, worked on the electronics. I mostly helped with sanding and painting. This entry was posted in Art, Exhibitions, Glass, Installations and tagged Ausome, Ausomeness, Diorama, Federal Way High School, Glass-o-rama, Kids Design Glass, Landshark, MoG, Museum of Glass on May 15, 2014 by Museum of Glass. The weather gods were kind to the glass world, as temperatures warmed up to the low 50s during the conference. With piles of dirty snow around, it seemed like the worst winter since the late 70s was on the way out. And yet the snow returned after we left. While it was boxed away in a small, darkened room, the “Enlightened Glass” exhibition at the 2014 Glass Art Society Conference in Chicago a few weeks ago was a best-kept secret. I crept in during a break in the action on Saturday and was hugely impressed with the range of vessel forms and sculptural work. Hopefully, GAS will eventually get some images from the show online; in the meantime, here is John E. Bannon’s “Bored of Frustration”, a whimsically titled, sculptural work that I enjoyed for its subtle juxtapositions: the figure is relaxing – but on a bed of nails. It also took a minute to realize that what at first appeared like an abstract line of glowing tube was actually a figurative sculpture. Instead of neon, the gas in this case in krypton, and a transformer enables the gas to appear to be moving, as little balls of light move from one end to the other. 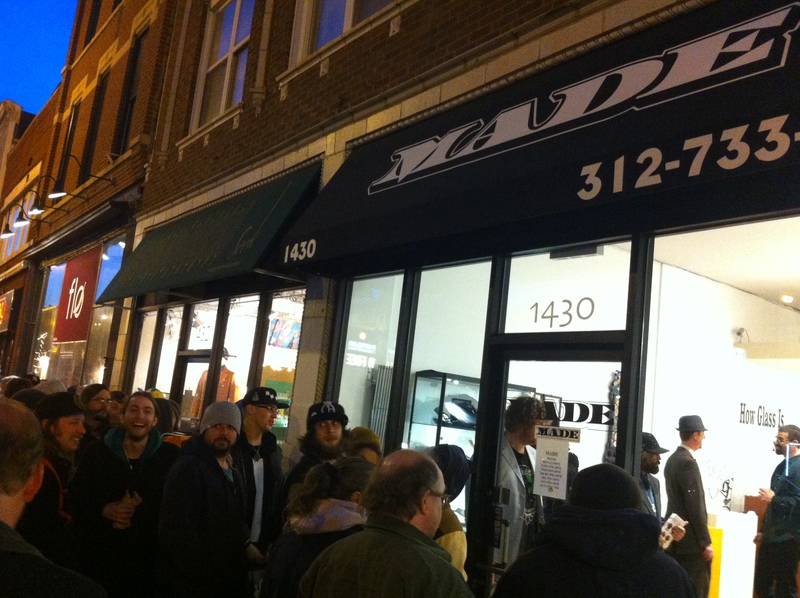 Friday night, Made Gallery hosted “How Glass Is…,” an exhibition of flameworking that ranged from pipes to sculptures. There was an immense line of people out front and for the rest of the evening, perhaps 200 strong, with a handful allowed entry every few minutes. So much for escaping the beaten path! 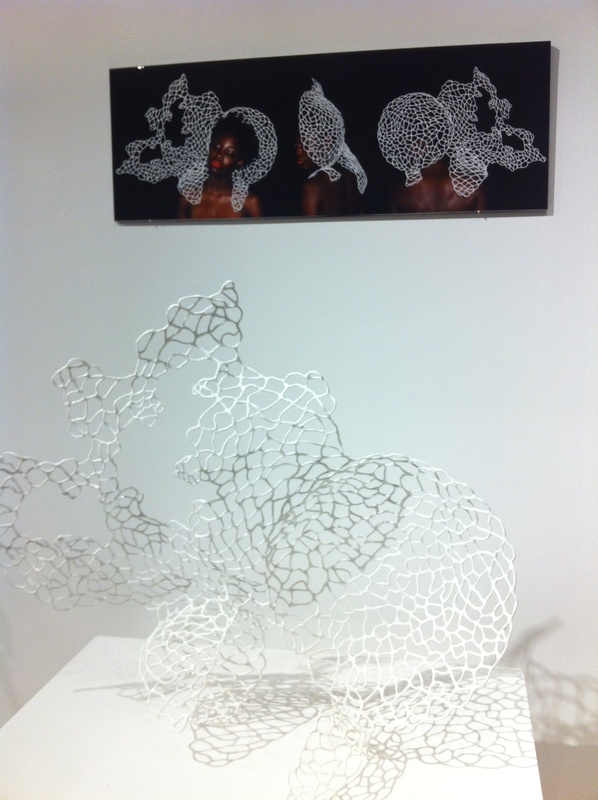 At the Made show, Sibelle Yuksek’s piece, “Dans Les Nuages” (“In the Clouds”), consisted of a lampworked borosilicate sculpture that functioned as a fashion accessory or elaborate hat – the installation included a great photograph of a model wearing the piece. Check out Sibelle’s line of wearable boro glass. David Francis works primarily as an artist-curator with a practice informed by poetics, critical theory and archaeology (MFA, PhD, University of Washington). As an adjunct college professor for almost 20 years, he taught in Delaware, Washington, Kentucky, Poland (Fulbright), Semester at Sea, and Hungary (Fulbright), finally settling at Cornish College of the Arts from 1999 – 2006, when he began to focus on making visual art, joining Center on Contemporary Art (CoCA) as an artist- curator in 2005 – 2013. 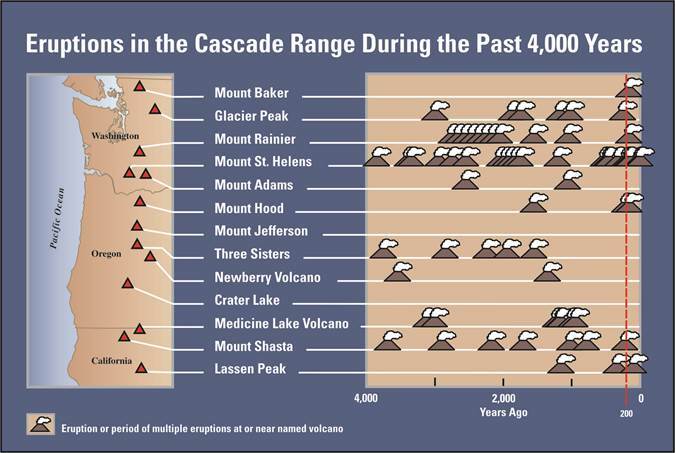 From the mid-1980s until 2011, he also pursued a parallel career in archaeology, surveying, testing and excavating numerous sites in four states. 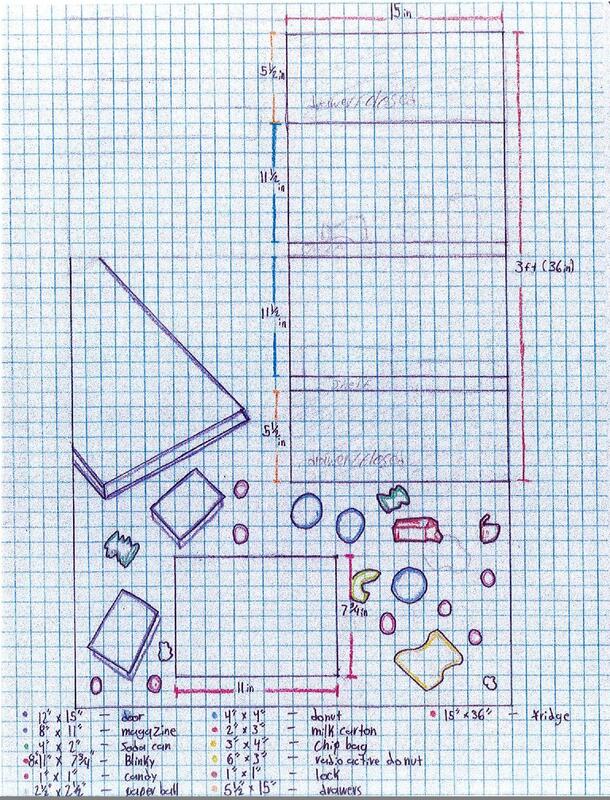 In addition to more than 20 curatorial essays in exhibition catalogs, his publications include numerous technical reports, an award-winning collection of poems and a book on the indigenous Zoque region of Oaxaca, Mexico. This entry was posted in Art, Artists, Events, Exhibitions, Glass, Installations, Museums and tagged 2014 Glass Art Society Conference, Bored of Frustration, Boro Glass, Chicago, Dans Les Nuages, David Francis, Enlightened Glass, Form, GAS, glass art, How Glass is, In the Clouds, installation, John E. Bannon, Juxtaposition, Made, Made Gallery, Museum of Glass, neon, pipes, Sculpture, Show, Sibelle Yuksek, Vessel on April 22, 2014 by Museum of Glass.